Ahead of the Munich Security Conference, the Prime Minister answered questions from Editor-in-Chief Sven Afhüppe and international correspondent Mathias Bruggmann. Question: Mr Prime Minister, thank you for finding the time to meet with us. You will come to Munich to attend the Conference on Security. Handelsblatt will cover the proceedings and primarily your participation in detail. We are happy to be able to talk to you in detail on important subjects – Russia and security. Mr Prime Minister, the world seems to be plunged into several geopolitical crises: Ukraine, Syria, and North Korea with its bomb testing. There are no clear solutions to many crises. What risks do you see in this new chaos that has engulfed the world? Dmitry Medvedev: First, I’d like to thank you for this opportunity to talk with Handelsblatt. On behalf of the Government of the Russian Federation and the people of Russia, I’d like to convey, through you, our sincere condolences to the readers of your newspaper in connection with the tragic rail accident in Bavaria. The world is a fragile thing, and in addition to manmade disasters, against which no one is safe, we are really not in the best stage in terms of ensuring international security. At any rate, my own experience tells me that we have known more productive times. What is the reason for this? I think there is a combination of reasons. First, some of the national and regional threats, of which my country, for example, warned as early as 10 or 15 years ago, have turned, in effect, into global threats. I remember our fight against terrorism in Russia’s Caucasus when we said that the people who fired at our military servicemen and our police were members of foreign religious extremist organisations, no one was quite willing to listen to us. We were told that they were just people displeased with the regime and fed up with corruption and that they were fighting for freedom. They drew a distinction between extremists and insurgents. But let’s admit it honestly: we found passports on them from many countries, including, for example, Turkey. So, what was at that time characteristic of one country or a group of countries, for example, the Middle East as a whole, where one feared to walk in the streets… I remember well my first impressions from a visit to Israel. It was perhaps in 1993, when I wasn’t involved in politics; I was an ordinary lawyer and a teacher at a law department. We just traveled to that country to see what it was like. Well, when everyone carries arms and tells you, “Keep in mind a bomb can explode at any time,” that was a disturbing impression. I thought then that they were all heroes living in that environment. Today, regrettably, this refers to all of Europe. And this is, perhaps, the main problem. Today one cannot feel safe in any country in the world. This means that terrorism has become a real global threat, transforming itself from an ordinary criminal pursuit that sought to achieve certain goals, including those of an extremist nature, into something more. In a number of countries, terrorists regard themselves as legitimate authorities and rule these countries through terrorist methods. If you don’t like it, we’ll cut your head off; if you don’t like it, we’ll cut you into pieces. In the name of what? Either in the name of certain religious dogmas, or just because “we think this is the right way.” This is the primary threat that, let’s face it, society has failed to deal with. Second, we have a lot of problems of our own on the European continent. They are of an economic nature, although at one point we even learned to face them together. I remember well what was happening in 2008 and 2009, and how we came for the first G20 meeting, and how the outgoing US president (George W. Bush) told me that Wall Street was to blame for everything that had happened. The new president, Mr Obama, said: look, we are sitting at the G20 table, we can come to terms, there are very different countries here – America, Russia, China, but we are discussing these problems together. This did work, but, regrettably, a lot has happened since then. We have many economic problems left in Europe (I’m not distinguishing between EU and Russian problems, or the world’s economic problems right now), but today we are not even communicating. Yes, there are G20 meetings, but they are mostly formalities or result in recommendations that are not always followed. The close contact that used to unite us – we used to discuss all economic problems with the German, French and UK leaders almost every month – this communication has been suspended and has been stopped. Is that good? I think it’s bad for our countries and our people, and for the economy. Question: What is the reason for the current split, and how do you propose mending it? We see a deep divide. You and Barack Obama initiated a reset policy, but neither country has taken advantage of this opportunity. How can we overcome this problem, this antagonism between the West and Russia? What solution can you suggest? Dmitry Medvedev: I will speak about this later, but now I’d like to finish answering your first question. All of this has resulted in a situation where the EU, individual EU countries and Russia have almost completely severed or at least seriously weakened their ties. Still, we have rather strong ties with Germany, but they are not what they used to be. Our economic activity has slumped by 40 percent. Who has benefited from this? It makes me wonder. We do maintain political contacts. The Russian President regularly holds talks with the Federal Chancellor, but they concern a rather small group of issues. They only discuss the situation in Ukraine. It’s true that this is a very serious European problem. But that’s almost all they talk about. In some cases they discuss Syria. But we no longer conduct the comprehensive dialogue we used to. I can assure you that this is the case because I participated in that process. And the conclusion is that the world has not become a better place, the number of problems has increased, and to boot some countries have stopped talking with each other altogether. As for the latter question, I don’t think the blame resets with us. We never shirked contact, and we were ready to talk in any format possible. But all contact has been deliberately curtailed by the EU, and then the same happened to Russia-NATO cooperation. So, my conclusion ahead of the Munich conference is that the world has become a more dangerous and darker place. Question: Who is to blame for this? Not Russia, you say. People in Europe feel that trust in Russia has weakened because of the Ukrainian crisis. Dmitry Medvedev: I agree that the issue of trust is of key importance, but let’s talk about the ways trust is created and the value of trust. Yes, we are suffering a crisis of trust. By the way, there was a crisis of trust also during the economic crisis of 2008-2009. How can this crisis be overcome? Only through contact, whereas our relations with a number of our European partners and the United States are frozen or are half-hearted attempts at dialogue. This is my first comment. Second, trust cannot develop in a matter of weeks. In fact, it took us 25 years since the establishment of new Russia as a state in 1991 to develop relations with our European partners. There came a time when I thought we were friends, that we talked the same language literally and figuratively, be it Russian, German or English, and that we understood each other well. There’s nothing left of this trust now. What makes me especially sorry? Of course, opinions may differ, including on the developments in Ukraine. But why derail absolutely all contacts, from political to economic ones? Look, the Soviet Union was not the easiest partner and not the friendliest country for Europe and for other countries, yet parliament speakers were never declared personae non grata before, not even during the most difficult conflicts, like during the Cuban missile crisis or the Afghan war. We can close the curtain and refuse to talk with one another. I believe that this would be a huge political mistake. They shouldn’t have done this as this hasn’t benefited anyone. We have our policy, for example, with regard to Ukraine and Crimea, and European countries have theirs. But we have stopped talking. Who has been punished? Question: How can this crisis be overcome? Dmitry Medvedev: This is the most difficult issue. Unfortunately, being a practical man I can tell you that there is only one way: to restore relations and contacts, to abandon stereotypes and to coordinate reasonable compromises. But then again, it’s not Russia who must walk the greater part of this path, because it was you who told us that we are bad; that our decisions contradict international law; that you won’t invite us anywhere; that you wouldn’t trade with us; and that you would introduce sanctions against us. Now that I’ve said all of this, tell me, has this changed Russia’s stance at least one tiny bit? I always provide the following example. As I said, the Soviet Union was not the best form of government and we definitely never tried to revive it. I know everything about the Soviet Union, for I was born, just as you, in 1965, and I was a young man during the Soviet period. Sanctions were introduced against the Soviet Union at least a dozen times (I counted them), in the 1920s, 1930s, 1940s, 1950s and 1970s. Did this change the Soviet Union? No. In other words, regrettably, we are on the wrong path. But it is our European partners, and first of all the leaders of the EU countries, who must walk the greater part of this path. I say this openly so as to avoid any misunderstandings. Even though the EU countries are also NATO members, and even though the United States is the largest global player, the EU and Europe have their own destiny, and so the leaders of European countries – not business people who want to trade, and this is clear – must decide if they want to repair relations with Russia. Question: You have made it very clear that it would not be in your interests if the iron curtain came down again and that you would like the political tensions to be resolved. As far as I understand, a major strategy for this will be worked out in Munich. However, my question is this: The Minsk Agreements are a key prerequisite for a resumption of closer ties. The German government’s stance is clear: all parts of the agreement must be fulfilled for the sanctions to be relaxed or lifted. Former chancellor Gerhard Schröder, in his interview to Handelsblatt two weeks ago, said that this is a mistake and it would be better to meet Russia halfway already now because the first parts of the Minsk Agreements have already been fulfilled. Do you agree with Gerhard Schröder? Is that the outcome you expect, that these countries will begin to cooperate with Russia sooner? Dmitry Medvedev: Gerhard Schröder is right. He’s absolutely right. It was a mistake. He’s an experienced politician, he headed the German government, but that’s not the only point. His view is fundamentally correct. I think right now European countries just need to get together and make some difficult decisions. The EU is not a monolithic structure, we all realise that. There are countries that feel phantom pain when it comes to the Soviet Union. They constantly suspect Russia of something. Hopefully, Germany is not one of those countries. The history of our relations went through two bloody wars in the 20th century. However, we are now close partners. Just recently, Germany was our biggest trade partner in Europe. Therefore, I believe this view is correct and they need to find courage to admit it. President Putin has said it repeatedly and I have said it too, we don’t see an alternative to the Minsk Agreements. The reason is simple: we are practical people and we don’t have any other option. If we had five agreements we could say, this one is good and that one isn’t. But we have only one. With contribution from the Normandy Four, we have reached some serious compromises. And I believe that during that period our partners – both Ms Merkel and Mr Hollande – demonstrated great responsibility. It is very easy to slam the door and say: we don’t hear each other, we don’t understand each other. However, we managed to work out a roadmap. And now we are moving forward according to this roadmap, sometimes faster, sometimes slower. At least, there are no active exchanges of fire. Some other terms of the agreement have been fulfilled. But what is the problem? One clause on political settlement is still pending. But it’s not Russia’s responsibility. To be honest, our European partners can hear us, unlike the decision-makers in Kiev. Elections, the amnesty and future government of Ukraine are not the issues for us or France or Germany to decide. These are Ukraine’s issues. However, these processes are deadlocked now. Yes, the talks continue and now the United States got involved. I think that is good because, let’s be honest, Kiev is listening very closely to what Washington says and the country’s leadership is, as we know, divided into those who look up to Europe and those who look up to the United States. At any rate, the Minsk Agreements are to be fulfilled since we don’t have any other option. But let me point out that the Russian leaders believe it is Ukraine’s turn to act. Question: You are saying that the Europeans should act. Wouldn’t it be a goodwill gesture on Russia’s part to lift some of its import bans, which would make it easier for Europe to decide on mitigating sanctions? Dmitry Medvedev: You see, the issue of bans has been demonised somewhat. First, you know Russia well, so you are aware that we are going through a difficult economic period, although it is far from catastrophic. Last year, Russia’s GDP decreased two and a half times slower on 2009, when things were much more complicated. In 2009, we faced no external restrictions, and the oil prices were not hovering at the $25-$30 mark. Nevertheless, everything came crashing down, and the slump was much more pronounced. Second, we are facing problems which are mostly linked with a critical fuel and energy price slump. Our budget largely depends on energy revenues, and, of course, mutual restrictions have exacerbated this process. Why am I talking about this? We didn’t impose these restrictions. They were imposed on us, and we introduced our own countermeasures – this is absolutely true. As you know, this came as a response. To be perfectly frank, these countermeasures are restricting our progress to some extent, but they are also helping us in some areas. I have been working on agricultural issues for many years, say, eight years, starting back when I was president. We faced a very dire situation, although Russia is an agrarian country, it has more arable lands than any other country in the world. Now we are able to feed ourselves. At some point, Russian farmers and our large agribusinesses came to believe that they can produce their own food, that they will not face competition in the form of food being dumped by some European countries at knockout prices (I repeat – at knockout prices), and they have expanded their own production capacity. In 2014, we spent around 240-250 billion roubles on support for agriculture, and we’ll spend the same amount again this year. In effect, we see this as a window of opportunity. Of course, this doesn’t mean that we are determined to draw out the sanctions. Our European partners should simply understand that nature abhors a vacuum. Someone is bound to fill this vacuum. The same applies to some other goods. We used to buy a lot of high-quality German production machinery, as well as cars. Germany now exports about 30-40 percent less of these mechanisms and machinery to Russia. This is bad because companies have fewer opportunities for implementing their own production modernisation and retooling programmes. On the other hand, we were forced to shift our focus to Asian markets. The quality of their goods is often worse than of German equivalents, but they have also learned how to make many goods. And we are also beginning to manufacture these goods. Question: But the economy and geopolitics have a global scale. Isn’t it dangerous to fence yourselves off in some areas, as you have said, including in the economy, even when this implies a response to foreign restrictions and sanctions? Any country, be it China, the United States or Germany, will have to play a certain role in this globalised world and to accept the roles played by other countries. You see, closing off borders – be it to refugees or goods – is an obstacle to economic success. Dmitry Medvedev: I am also a supporter of an open market economy, and I proceed from the assumption that Russia joined WTO and accepted all principles of an open economy. Indeed, the economy is global. But Russia didn’t fence itself off; we were told that certain goods will not be sold to us. Moreover, our potential decreased after European banks stopped lending to us. On the one hand, it is holding us back, and, on the other hand, it is helping us. Regarding high-tech goods, I agree that it is very hard to get anything done in isolation. The world is so permeated with all this; electronic communications systems, high-tech and digital solutions have become so commonplace that it’s impossible to imagine that we’ll renounce all this. Russia is not a country to fence itself off in this respect, the way the Democratic People’s Republic of Korea is doing. But, in some cases, this really benefits us. Let’s be honest, why should we buy Polish apples when we have exactly the same climate? Our Polish friends started actively delivering their apples to Russia; they saturated the entire Russian market and charged low prices for them. Great work! Although Poland is not a southern country, it has thriving agribusiness. Since the EU countries weren’t too enthusiastic about buying their produce, they sold all their apples on the Russian market. But we have the same orchards, so why should we buy anything from them? In this context, I believe that import substitution projects are absolutely essential and justified. Question: During the latest major economic crisis, Russia asked the International Monetary Fund for assistance, and received it. Can you rule out another bad crisis that would require IMF aid again? Dmitry Medvedev: I think you mean the crisis of the 1990s – 1998, to be precise – because we did not address the IMF in 2008, 2009 or 2010. Actually Russia is itself a benefactor. I believe the chances of our appealing to the IMF again are miniscule at best. We would like something different. As you and I have already discussed, many of our problems are artificially created. It would be easier to address many of them if the European capital markets were open to us. That’s the objective truth. Now we have to make do with domestic loans and subsidies. Question: Nature abhors a vacuum, as you have just said. Can we say that Russia has embarked on a strategy that has caused it to make a U-turn from Europe to Asia? But then, Russian-Chinese trade has also decreased by 30 percent. So is this strategy efficient at all? Dmitry Medvedev: Any nation might have problems. China and the EU are no exception, and neither is Russia. It isn’t so much a matter of making U-turns. In fact, it’s Russia’s destiny to look both ways, to face both east and west, and we have always said so. However, we were very active in trade and investment partnerships with Europe in the 1990s and the beginning of the 21st century. Our trade hit the 450 billion euro mark and, on the whole, the European Union remains our principal trade partner to this day. We paid tremendous attention to this partnership, and Asia might have receded from the list of our top priorities. Yet, the latest developments and the dynamism of the Asia-Pacific market prompt us to develop closer contacts. China is our strategic partner. But then, you are right that however huge China and its economy might be, it has its own problems, too, and it cannot save the world. Be that as it may, today Russia and China enjoy advanced and versatile cooperation. I visited China at the end of last year and had intergovernmental consultations with our partners there. All this holds not only China but also all the Asia-Pacific countries. We visited several of them in connection with the APEC summit – the Philippines, Malaysia. I also paid a short visit to Cambodia and have been to Vietnam before. All of them are our trade and investment partners. By the way, Russia and Vietnam have reached an understanding for the creation of a free trade zone – something we have failed to achieve with other countries. The Russian-Vietnamese market is open, and Vietnam, as a rapidly developing economy, very much wants this. To be in contact with both Europe and Asia simultaneously is not a political decision but rather a merely pragmatic necessity. If our European colleagues determine to resume a normal partnership with us, we will gladly return to our one-time close cooperation in many areas. Question: As for foreign political decisions, what role in the world is Russia after? Can it afford a leading geopolitical role, considering its current economic situation? Dmitry Medvedev: I don’t think we are after geopolitical leadership. Let those who are out for leadership assume responsibility for the whole world. Let them answer for wars and for migrants wandering about Europe by the hundreds thousands. That’s not what we want. We overcame that infantile disorder in the Soviet era. Now we don’t want to be global managers any longer. However, Russia should occupy the place it deserves in the world due to its history, geography, opportunities, Security Council membership, and other aspects of its formal status. Last but not least, Russia is a major nuclear power. All this places a measure of responsibility on us. We are not trying to rule the world or impose our regulations on it, though we are accused regularly of having such ambitions. Really, some people say that we are such and such, only out to take control of everything. That is not so – we are a pragmatic people who realise that no one can shoulder responsibility for the whole world, not even the United States of America. Question: But there are crises in the world, including the fight against ISIS and the civil war in Syria, which cannot be stopped without Russia. How can Russia help to stop the civil war in Syria? I think it is the biggest challenge, and it has led to the migrant crisis in Europe. Germany is one of the countries that has to deal with its consequences. What could be Russia’s contribution? We have been hearing about Aleppo shelling in recent days. Perhaps, you could tell us whether the reports that somewhat confused the West are real? What is Russia going to do next, step by step? Dmitry Medvedev: Russia became involved in the Syrian conflict in order to secure its own national interests. Obviously, we would not be doing it had the Syrian leadership not requested our help and military support. I always give an example that nobody can object to because most of the people talking about Syria have never been there. I was in Syria on an official friendly visit before the war. I can tell you that at the time Syria made a lasting impression on me. It is an ancient country with many ethnicities and faiths living successfully together. It was a peaceful and mostly secular country – you could see it from the way women dressed, the way people looked in the street, and so on. What happened later is a compelling lesson of how easy it is to create a problem and how difficult it is to solve it. At some point, it occurred to our colleagues that Mr al-Assad is not behaving as he should (if such terms can be used in foreign policy). I will tell you exactly who I am talking about: our partners in the United States, some of our European and Arab partners, including Saudi Arabia, for example. We may differ in our opinions of certain political leaders but it is not a good enough reason to begin intervention or to stir up unrest from within. Now the country is being torn apart by a civil war. Everybody is fighting with each other, the Shias with the Sunnis, the Sunnis with the Druze, Christians and Alawites. Does anybody benefit from this? Perhaps, al-Assad is not an exemplary democrat but the solution was to insist on an election instead of starting a military campaign. Everybody lost in the end. Why are we securing our national interests there? As you know, Russia is a multinational and very complex country. We have our own religious extremists, whom we have fought for a very long time, generally with success, in the Caucasus. They still manage to leak into other countries from time to time. I’m thinking about the unfortunate Mr Mubarak (Hosni Mubarak, former President of Egypt), who told me during one of my visits: “For your information, there is a huge number of immigrants from Russia and some CIS countries here. You should thank me for being tough, otherwise we would have a bloodbath here.” Then the Arab Spring happened and we all know the destiny of poor Mubarak because our American ‘friends’ – those he was loyal to for decades – stitched him up and let the extremists take over power. It is only now that Egypt is starting a new chapter in its history and there is a revival. Therefore, we understand that the people who went to Syria (and there are at least several thousand of them now although we don’t have accurate figures because we can’t count them all up, who left when, but their number runs into thousands) will come back as completely brainwashed murderers and they will do the same as what they did in the past in the North Caucasus, in Moscow and other Russian cities, what they did in Paris and all over the world, including the United States. Question: Did you say there are thousands of Russians (in Syria)? Dmitry Medvedev: Yes, there are thousands of people from Russia there. This is why President Putin decided to respond to the Syrian President’s appeal to take part in this combat operation. It is not an unlimited but a temporary operation. And it is a local operation involving the use of aircraft and, in some cases, missiles. That is, we don’t want to take part in the land operation; we’ve only sent our advisers there. In other words, we consider this to be a localised, though very important mission. As for forms of cooperation, I will certainly speak about them in my speech in Munich. We cannot agree on Ukraine and on some other issues, for example BMD, and there are other problems in our relations. But why cannot we agree on Syria? Those bastards are doing their vile deeds everywhere now, including in Russia and in Europe. But our Western partners refuse to maintain contacts with us, curtailing them whenever they can. Ties at the level of defence departments are only sporadic, and they don’t want to create a coalition, claiming that we are fighting the wrong forces. I’ve said this more than once: Let’s sit down at the negotiating table, hammer out an agreement, invite all those who are fighting terrorists (this has been done in Geneva, though not very successfully) and decide how we can fight this evil together. We tell them: Show us the maps, show us where the so-called moderate opposition is located. This is a separate and very complex matter. We remember how it was in Afghanistan, when we were told that there are good and bad Taliban groups, and that we should befriend the good Taliban and the bad ones should be destroyed. And then there was 9/11 and other tragic events. It’s all very complicated. And it’s not a fact that those who describe themselves as moderate are actually so. But we are willing to discuss all of this. President Putin has told this to his partners again and again. This means we must sit down at the same table, but our partners avoid this. That is, there have been some occasional meetings, telephone conversations and contacts between our militaries. But in this situation we should create a full-scale alliance to fight this evil. Meanwhile, the problem has developed into a migration crisis. I must say what I think on this issue. My European colleagues may not like this, but I believe that this is an all-out and total failure, an all-round fiasco of the European immigration policy. Complete washout. Couldn’t they have foreseen this several years ago? Are their analysts this bad? We also feel sympathy for and want to help refuges and we are doing this. I’m sorry, but flinging doors open, as they did in Europe, and inviting everyone who wants to come in is silly, if not worse. And what now? A huge number of people from Syria and neighbouring countries are entering Europe. Who are these people? Some are fleeing the war, and there are many of them. They want to survive and, frankly, to receive the promised EU financial assistance. I think these allowances are approximately ten times larger than what these people earned in Syria. We are sorry for these people, but this is the EU’s decision. However, some of these people – and it’s not just a few strange individuals or utter scoundrels, but hundreds and possibly thousands – are entering Europe as potential time bombs, and they will fulfil their missions as robots when they are told to. It’s almost impossible to find them, for they all are peaceful civilians who are fleeing the war. I recently met with Finland’s Prime Minister, and will meet with the Finnish President on the sidelines of the Munich Conference. Both of them are very concerned, for part of these people (enter Finland) across our border, but we have no legal basis for stopping them. There’s the European Convention on Human Rights, which we have joined. We intend no harm, and it’s not our intention to dilute our neighbour, Finland, with these migrants. But what can we do? We’ve agreed to create a joint group to streamline our efforts on this issue and we’ll continue to do so. We are ready to work with everyone, including Germany. But migrants are a big headache, and frankly, it was created by the EU leadership. Question: You said that Russia did not want to launch a ground operation. What is your estimate regarding the fact that some Arab countries are now ready for it and want it, and also want the United States to assume leadership? Dmitry Medvedev: Our estimate is negative because all ground operations, as a rule, lead to permanent wars. Look at what is going on in Afghanistan and a number of other countries. I don’t even mention the ill-fated Libya. A ground operation draws everyone taking part in it into a war. The Americans must consider – both the US president and our Arab partners – whether or not they want a permanent war. Are they hoping for a quick victory? This doesn’t happen in reality, particularly in the Arab world. They have everyone fighting everyone. They don’t have a situation where there is al-Assad and his loyal forces and some anti-government opposition. The reality is much more complex. This means that a war will last for years, if not decades. Why would anyone want that? We must make everyone sit down to the negotiating table, and we can do it by using, among other things, the harsh measures that are being implemented by Russia, the Americans, and even, with all reservations, the Turks, rather than start yet another war in the world. We know well what scenarios are followed in this context. Question: The Islamists’ radicalisation seems to be the main threat to peace all over the world as well as to the entire international community. Could we be mistaken in paying too little attention to Islam and Islamic movements? Can the radicalisation be arrested at this stage? How can this problem be controlled? Or is it that Islam in itself does not lend itself to reforming? Does the Quoran contain values that you in your world – or we in our world – don’t share? How can this problem be solved? Dmitry Medvedev: It’s a very difficult problem, but it can be solved. Let me remind you that Russia is not only a (predominantly) Christian country, but also an Islamic country, and that we live in peace with our Islamic brothers who have lived in Russia for many years, for centuries. This coexistence has been entirely normal and peaceful. Moreover, I can tell you that in the Soviet times, when I was at school, it didn’t even occur to me to ask about this or that person’s religious beliefs. We had atheism at that time, but there were many believers as well, both Christians and Muslims. But society was absolutely monolithic. Later this fire was fanned out. To reiterate: Europe has committed strategic mistakes: its immigration policy has led to an uncontrolled shift in the religious balance in many countries. The problem is not that representatives of the Islamic Ummah, or diaspora, are coming to Europe; the problem is that this influx is uncontrolled. They don’t want to become assimilated or get an education, and they even feel hostile towards everything European. But we all share European values and a European identity, and this is something characteristic of Russia. This was, therefore, a very serious and gross mistake, as I see it. Right now it’s necessary to build bridges and reduce tensions (there’s no other way, if we talk about dialogue inside EU countries), and try to come to terms with the ethnic communities. I understand how difficult it is, as I do understand that many of them don’t want to come to terms at all, while some – and this is the most terrible thing – are born and educated in European countries but later launch terrorist attacks there. It’s a fact of life and there is no easy remedy. I have only emphasised that my country has a centuries-long experience of coexistence between the Christian and Muslim communities. But this coexistence is not without problems either. You may remember what was happening in Russia in the 1990s and in the early 2000s, when we had an inflow of adherents of other bodies of Islam that were absolutely at odds with what was accepted in Russia. (As you may know, there are many persuasions of Islam that are even more hostile towards each other than to other religions.) They brought this culture and we had to put our house in order. Regrettably, I don’t rule out the possibility of a similar situation taking shape somewhere in Europe. In that case – God forbid! – you will have to face what we did in the 1990s. Of course, we wouldn’t want this to happen at all, and we do hope that you’ll manage to find the right approach to ethnic and religious policies. And, again, this story differs from country to country: it’s one thing in Germany, and quite another in France, and still another in Hungary, and still another in Austria, but you are all in the EU. There are 28 EU countries and you must come to terms on something together, because if you simply start ruining the Schengen space, this is likely, first, to entail what is in effect a disintegration of the European Union, and, second, you will achieve nothing because the extremists will only be pleased to migrate from country to country. We are ready to take part in these consultations. The world has become transparent, with people moving both away from and to Russia. But we have been largely removed from this dialogue. They are coming to see now that these issues cannot be addressed without Russia, both in light of its geographic location and historical experience. Question: Do you think this crisis will destroy the EU? Dmitry Medvedev: I’m not saying this. 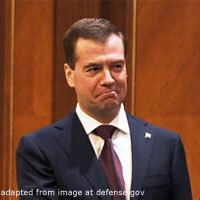 Dmitry Medvedev: Frankly speaking, this would be a most dramatic turn of events for the EU. As I said, Russia is a major trade and investment partner of the EU, even despite the current complicated relations. We keep part of our currency reserves in euro, and so we want the euro to remain stable. I have always told this to Ms Merkel: “Angela, there’s no doubt that we are interested in a stable euro.” Moreover, I was partly against the US dollar because the world cannot function properly with a mono-currency system. We have partners and friends, and many of us have relatives in Europe, so we don’t want this scenario to play out. But the situation is so alarming now, and if we start cutting up everything, and doing so without coming to an agreement with one another, this would have extremely negative consequences for Europe. They will be much more serious than those that Europe faced during the latest economic crisis or when it tried to save Greece, Portugal or Spain. Question: Handelsblatt is Germany’s leading newspaper on economic matters. As you have said, economic relations between Germany and Russia have been developing very well for years, and now many German companies are complaining about the sanctions. How can you describe our economic relations? Do you think they can be maintained at a high level after the current sanctions phase is over? Dmitry Medvedev: These relations are ailing, but they can be cured. And the treatment is very simple: to resume dialogue and restore mutual trust. Businesses trust each other. The number of joint ventures has barely decreased; the volume of trade has decreased but the number of joint ventures has not. Business wants to work, both in Russia and in Germany. But the final decision rests with European politicians. It is regrettable that Russian-German trade has plummeted by 40 percent, and our trade with the EU is down by 50 percent, but the situation will continue to worsen if we further aggravate the problem. It takes courage to admit that the economic sanctions should be lifted because they haven’t done anything good for either Europe or Russia. We are ready for this, but once again, we are waiting for our EU colleagues to make the first move. And lastly, I will have a working breakfast with representatives of the German Committee on Eastern European Economic Relations in Munich. Many of them are our partners and friends and cannot express their opinions publicly, for understandable reasons. But they tell us off record that they wish all of this would end as soon as possible, because sanctions are only harming all sides, and they don’t understand why they continue. I will be accompanied by a group of Russian business people who will discuss the restoration of business cooperation. There are many opportunities for this, starting with what we have already accomplished and ending with Nord Stream 2, which would definitely benefit our major partners. Question: Do you think it can be implemented in Europe? Dmitry Medvedev: There are two major factors at play. As I see it, the German Government rightly says that it is a commercial project. We fully agree. Had it not earned us money, we would have never launched it in the first place. We have Nord Stream 1. I recall the opening ceremony and my long conversations with the Federal Chancellor and other colleagues. We have calculated that Nord Stream 2 would be profitable, considering gas consumption in Germany, which increased to 45 billion cubic metres of Russian gas last year, as far as I know, and in many other countries, and in the context of decreasing internal supplies in the EU. This means that we should coordinate it as a commercial project. But there is also Brussels. We respect its stance, as it is the supreme authority of the European Union. And there is also the notorious Third Package, which we don’t see as an optimal or fair solution. We believe that in some cases it interferes with some countries while playing into the hands of others and creates a disbalance. Some European leaders may disagree with me. Some of them believe that they will lose their transit fees, for example, if gas supplies bypass Ukraine. But frankly speaking, Ukraine is a problem country, and not because of our current relations, but simply because of the high risks involved. Many other countries believe that they and their businesses would benefit from the new project. But the most important thing is that we will diversify supply routes and therefore enhance the reliability of our deliveries. And the last thing I want to say is that this is a very important issue. It’s obvious that it will not increase the EU’s alleged dependence, because dependence is always a two-pronged issue. It’s true that you import gas from Russia, which is very good and beneficial for us. On the other hand, if you stop buying it, this will come as a major trial both for us and for the EU. So, this dependence is mutual, and mutual dependence is called business.